Tom Brady and the New England Patriots have good memories when it comes to being doubted or disrespected, so you know Brady kept this early edition cover of the Boston Globe from the Super Bowl, just so he could pull it out for an April Fools’ joke. FOXBOROUGH, Mass. -- It’s been a good offseason for Patriots quarterback Tom Brady, who is coming off the fifth Super Bowl championship of his illustrious career and had a pair of stolen Super Bowl jerseys recovered after a month-plus search. The Patriots also acquired wide receiver Brandin Cooks in a trade with the Saints, adding a dynamic 23-year-old playmaker to an offense that finished third in points per game last season. Friday, the 39-year-old quarterback is due a $14 million deferred signing bonus stemming from a contract extension he signed with the team last offseason. As part of that deal, Brady received a signing bonus of $28 million in total, paid out in two installments, one at the time of signing plus the $14 million due today. It’s not uncommon for teams to pay out large signing or roster bonuses in multiple payments, as it’s a method of cash-flow management. Deferred payments have no impact on a team’s salary cap. Brady’s deferred payment of $14 million mirrors that due to Colts quarterback Andrew Luck, who signed an extension last June that included a $32 million signing bonus, paid out in two installments. The good times continue to roll for Brady. Because Super Bowl LI between the Patriots and Falcons was such a tale of two halves -- the Falcons dominated the entire first half and part of the third quarter before the Patriots stormed back from a 25-point deficit -- it was totally believable early in the evening that the Patriots were going to lose. As such, people who got the early edition of the Boston Globe, including CBS Sports’ J. Darin Darst, got a copy that featured the Patriots losing to the Falcons . 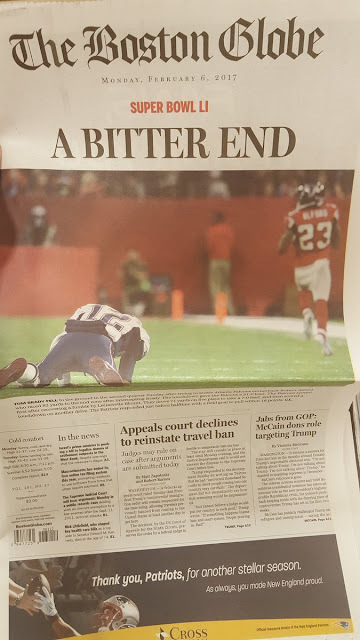 Well, the headline did anyway -- it was an early edition for Monday with the headline “A Bitter End” and a shot of Brady on his knees after watching Robert Alford return an interception for a touchdown. As everyone who stuck around and watch the game knows, that was not an accurate portrayal of what happened in Super Bowl LI, as the Patriots stormed back behind Brady’s record-setting MVP effort and won in overtime. So Tom Brady took the time on April Fools’ Day to remind everyone of this, posting on Instagram a picture of the #FakeNews that the Globe delivered to various stops (one of which he clearly decided to acquire). 0 Response to "Tom Brady saved this April Fools’ joke from the Super Bowl"